This flyer is perfect for your spring party. The package comes with a front and back site, enough room for all your information and to enjoy .. The PSD file is setup at 1275px x 1875px (4×6” with .25” bleeds) CMYK 300DPI .The PSD file is very well organized, with color coded ..
Beautiful Flyer for the upcoming spring season. 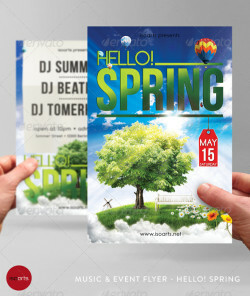 The package come with a front and back site, enough room for all your information and to enjoy ..
A modern and unique flyer template for your next spring party. Easy to modify, like changing colors, dimensions, etc. All text is editable. ..
Easter Egg Hunt Flyer Features: Include color options Fully Customizable 5.9×8.3” (A5) 1772×2404px 300DPI CMYK Fully layers Well Organized. ..
Easter Bunny Flyer Vol_1 Model image not include with download folder Features: Fully Customizable 4×6” 1275×1875px Bleeds.25” 300DPI .. 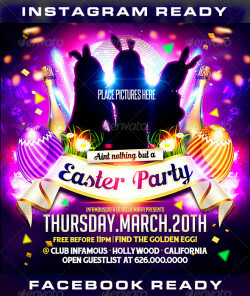 This flyer is great for a “Easter Sunday” Event, super easy to edit, you can easily change Texts, Colors, Add/Remove objects to this .. Description Promote your party with this clean and colorful flyer/poster. The colorful design makes it stand out from others and it’s .. Happy Easter Flyer Template 1 PSD file – 5×7” with 0.25” bleeds | CMYK – 300dpi | – Ready to print with guides Super Easy to edit ..